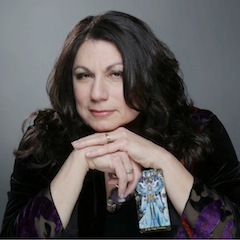 Corbie Mitleid is a world-renowned psychic medium based in New York. “God gives all of us what we need for a life filled with miracles and joy. My own life has shown me that as long as our hearts are open, whole, and aligned with Spirit, anything is possible. If I can share that blessing with others, then I’m doing things right. And it never hurts to bring laughter on the path with you! I have been on the mystic’s path for over 40 years, searching out new and gentler ways to bring peace and harmony to body, mind and soul. PLEASE NOTE: This is my full time profession, and while I do occasional free readings at psychic fairs and during my monthly free reading hour on Fire Through Spirit’s Facebook page, I can’t respond to email requests for free readings. What does “Corbie” mean and why did you choose that name? I chose the name Corbie to honor ravens, my guides and avatars. Raven is the guardian of in absentia healing, a courier on the Spirit Road, and is first cousin to Coyote the Trickster as a major deity for Northwest Native tribes such as the Haida and Tlingit. What made you think you were psychic? I knew there was magic in the world. I just had to find it. Fast forward to 1973, when I was a senior in high school working part time at Spencer Gifts. That was the year the James Bond movie Live and Let Die came out, with Jane Seymour as Solitaire, the Tarot reader. Spencer carried The James Bond 007 Tarot Deck – and I bought it. After all, we were all hippies then! And since 1973 I have delighted in investigating different ways of teaching, counseling and healing, all starting from picking up that first pack of cards and discovering what I could do. You have many more abilities, though – not only Tarot, but past lives, channeling and mediumship. How did you learn all that? In 1994, working on some past life investigations proved to be a catalyst for my own abilities. Without formal instruction of any kind, I found myself able to do hands-on healing work, distance energy work over the phone, and act as a liaison between discarnate entities and those of us currently in body. I proved to be a doorway Home for souls caught in the Grey Space—those who have died, but for one reason or another cannot get to the Light on their own, and therefore haunt the living. And I found I had a talent for channeling souls and Higher Selves for those who need to know the “hows and whys” of their life challenges. What I do now is a combination of those unexpected gifts and the more accessible tools I’ve found useful over the years. I continue to hone my skills; my certifications are testimony to the ongoing work. My goal is to continue living the “examined life,” not only learning more technique, but also going within myself to eradicate fears, bias, judgment, ego—anything which can get in the way of unconditional love and compassion. You do a lot of psychic fairs and public events. Is a reading with you appropriate for a public place? What about scary information, bad news, that sort of thing? Despite the elegant clothes and table trappings, most folks say sitting with me is a comfortable, safe experience that feels like they’re with a long-time friend, not a stranger spouting a bunch of mystical hoodoo and pretence. And I don’t believe in “bad news” — we have opportunities we can go after, and challenges to get past. My job is to give you the tools and courage to deal with both situations. Everything else is free will, and up to you. Never forget that! You talk about “laughter on the path” — what do you mean? I’ve long loved – and admired — the mystic comedian Swami Beyondananda (Steve Bhaerman), who managed to give his audiences some real “home truths” by presenting them with humor and an unusual viewpoint that people will remember long after they have seen him. Like Swami, I’ve discovered that if you get people laughing, their everyday conditioning is set aside and they are more apt to listen to what you have to say. Laughter won’t compromise the truth— it just makes it more palatable. You say that everyone is their own best healer. Why is that and what does that have to do with my reading? No one’s experiences or challenges are quite like yours. It follows that any healing journey you take will also be uniquely your own. One of the ways you can find your healing is through self-knowledge: understanding why you do what you do, and how those actions bring certain events into your life. Though I may walk with you as guide or mentor, you’ll discover your own wellspring of healing abilities, and that you can turn even the toughest road that Spirit sends you into a journey of fulfillment. What is a Certified Professional Tarot Reader? I was designated a Certified Professional Tarot Reader through the Tarot Certification Board of America, which was a nonprofit organization setting standards for amateur and professional Tarot readers. Practitioners were certified by standards of knowledge and skill established by the Board and guaranteed by a standardized testing procedure. While the Tarot Certification Board of America is currently on hiatus, the certifications they bestowed are still very much legitimate. By coming to a Certified Professional like me, you are assured of adherence to accepted standards of ethics and excellence, the legitimacy of a certified practitioner, and adherence to the TCB Client Bill of Rights. What is a legally ordained Minister?